INtelligent Direct: Why the $%&#@!! are they not getting my emails? For marketers, email deliverability is almost always an afterthought. The only time email deliverability best practices get any attention is when there is a problem and people are not receiving emails. What marketers notice first is a declining open rate for emails where they normally see a higher rate. This is a symptom of an email deliverability issue. Marketers may question whether the creative is tired or whether the content wasn’t resonating with the audience this time. What they’re not taking into consideration is that it’s difficult to open or click an email that never made it to you in the first place or you didn’t know you had because you rarely check your junk folder. Email delivery is the ability or inability to deliver a message to an intended recipient. Whether your email routes to the inbox or junk folder, sometimes it’s delivered but quarantined by the recipient’s email server filters for analysis. Any email service provider (ESP) will report any email where delivery was attempted and doesn’t bounce as delivered. This means that when your email platform attempted delivery using their message transfer agent (MTA), it was allowed in by the recipient’s email server. Where it is routed after that is not something the ESP can detect or know. Being able to reach an inbox or getting routed to a junk or spam folder is another aspect of deliverability, but it is really more of a routing and sender reputation issue than a delivery issue, since the emails were technically delivered. This is where things get the trickiest when consulting with senders. So where are emails going if not to an inbox? There are many nets your emails can get caught in that will prevent you from reaching an inbox. Remember, this isn’t personal. These are servers talking to servers through filters. The first hoop to jump through is with the internet service provider (ISP). 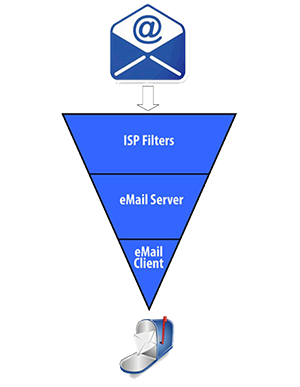 The next hoop is the email server administrator, who is responsible for adjusting filters to keep spam in spam and real email in the inbox. Finally, there are junk folder rules that get trained over time by the inbox owner’s engagement with emails they receive. For example, if you repeatedly delete an email from a sender without reading it even when you signed up to receive the emails, your junk folder will begin to route those to your junk folder. Think of this as an artificial intelligence (AI) machine learning algorithm at work because that is exactly what your junk folder is. The ESP sending email on behalf of your domain needs to be configured properly. The foundation of deliverability and what I always check first is that the sender email domain has domain key identified mail (DKIM), sender policy framework (SPF) and domain-based message authentication reporting and conformance (DMARC) authentication. Say that five times fast. If those things aren’t in place it is futile to try anything else. Some senders prefer to use an ESP-managed sender email address, which means the emails are using authentication. But the emails wouldn’t be coming from your domain, and these are typically considered SPAM emails and routed accordingly. I would never advise senders to go this route unless they’re doing a list acquisition email and the list vendor is sending the emails from their ESP. Email marketers must lead with purpose first, and that purpose must align with a need the recipients of the email share. This is the very root of segmentation. Segmentation is what differentiates an “email blast” from “email marketing.” The recipient must find value in your content, and the call-to-action must be crystal clear. Ideally, the recipient has a positive perception of their relationship with you, knows what content they typically receive from you and can edit their email preferences on an email preference center should they no longer want specific types of content from you. The way emails are created has evolved a lot over the last five years. What used to always be a manual deployment now has automated elements or is completely automated. The gold in content marketing is to put the content where it can live a long, full life and that is on your website. Assuming your website’s content management system (CMS) has the ability to tag the content and also publishes that content with a real simple syndicate (RSS) feed, you can fully automate when emails are sent and what content is pulled into the email that the recipient is interested in. This would allow marketers to shift their focus to strategy from execution. What hasn’t changed is that the best practice is a clean and responsive HTML email template without extraneous code that can inflate the HTML file size. It’s very important to analyze delivery metrics (bounces, opens and clicks) and compare them to other email deployments so you have a good understanding of what your baseline metrics look like for the types of emails you send. Then you can compare your baseline metrics against industry standards to see if you’re north or south of those metrics. It’s also important to do this analysis for bounces within 24-48 hours of deployment. This is because in the event you need to reach out to the bouncing domain, email administrators typically will not entertain any domain or IP whitelist request for any emails deployed if the time frame was greater than 48 hours. Invalid email addresses that have been invalidated by your ESP and therefore delivery attempts are suppressed to protect your sender reputation, BUT those invalid email addresses are still on your list that you’re sending your emails to. If you have many of these, consider removing them from your list and running those email addresses through a list verification system like BriteVerify. Valid email addresses where delivery has been made BUT they haven’t opened or clicked through on any emails in more than than 90 to 180 days. This is what I like to call list “dead weight.” These not only hurt your deliverability but also negatively impact your open/click-through rates. Remove dead weight from your lists and see your metrics improve immediately. In very simplistic terms, continue doing what is working and discontinue doing what isn’t working. How do you know what is/isn’t working? Consider using your delivered/open/click-through rates as the litmus test for success.